Home » Blog » What is the Strongest 3D Printer Filament? What is the strongest 3D printer filament? Airwolf 3D CEO and Co-Founder Erick Wolf gives a rundown on the results of a 3D printer filament strength test featuring PLA, ABS, Nylon, and Polycarbonate. 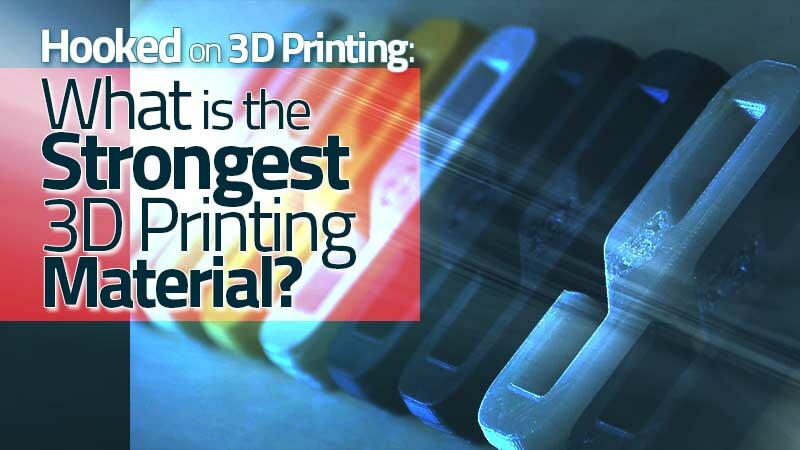 This blog post was adapted from the video, What is the Strongest 3D Printer Filament? 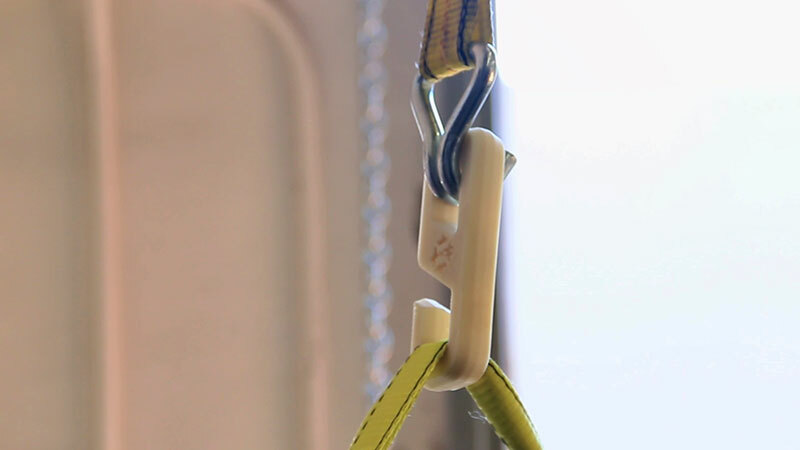 and is part of the series, Hooked on 3D Printing: A Study in Material Strength. Hi everybody, Erick Wolf here from Airwolf 3D. Today I’m going to talk about the strength of commonly — and not so commonly — 3D-printed materials. Specifically, we’ll be testing PLA, ABS, NYLON 910, and POLYCARBONATE. We’ll test each material by printing a common hook and then loading the hook with weight until it fractures. 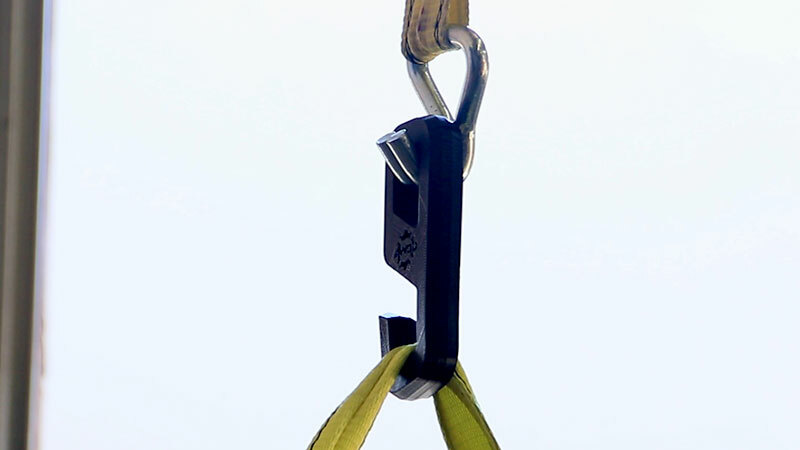 The hook that takes the most weight will correspond to the material with the greatest tensile strength. To back it up, we’ll pull some information from a great article on 3DPrint.com referring to tensile strength of commonly 3D-printed materials. 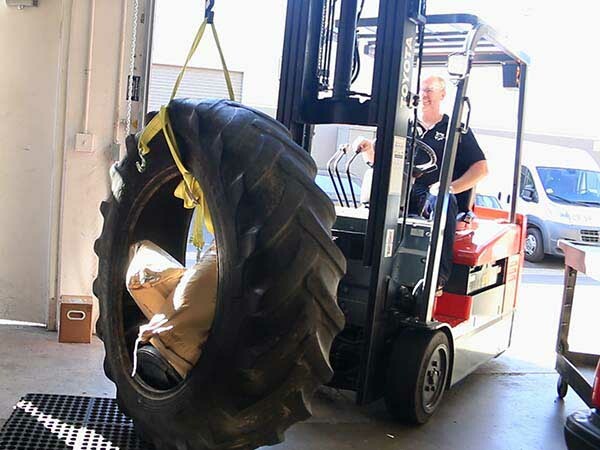 To keep it interesting, we set up a fun experiment using our 3D-printed hooks to pick up a tractor tire weighing 150 pounds and loaded with hundreds of pounds of additional weights from Precision Fitness, our local gym here in Costa Mesa, CA. 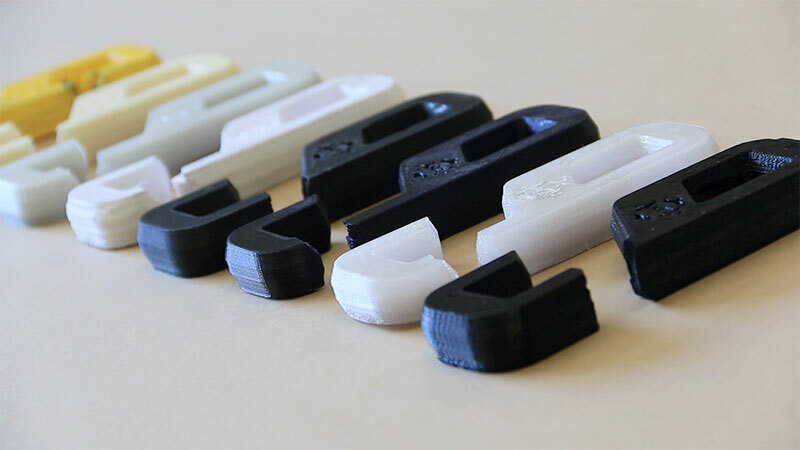 To test the strength of hooks printed in different 3D-printing materials, the Wolfpack loaded up a tractor tire with weights from a local gym and 50-lb bags of raw polycarbonate plastic pellets that the company uses for manufacturing filament. So let’s get on with it and start talking about our materials. The most popular desktop filament is probably polylactic acid, or PLA. We print PLA with the heated bed at 60 degrees Celsius and a coat of Wofbite Nano. It’s also best to keep the lid off as PLA is sensitive to high temperatures. PLA is an environmentally friendly, compostable filament that prints easily at low temperatures and looks great. It’s also pretty strong. It’s pretty darn impressive that PLA survived up to a 285 lb lift. We probably could have eked a few more pounds out of it, but the hook was already yielding. Truth be told, we were surprised with PLA’s strength. However, with a tensile strength of 7,250 psi, this is a strong material. With that comes a caveat, In this case, a caveat that can swallow the entire utility of PLA. Because PLA is biodegradable, don’t be surprised if it starts breaking down during use. In the sun especially, PLA is unpredictable and can change forms with a few hours. So please don’t print your tow hook out of PLA — it should not be used for anything supporting a load. Stick to what PLA is best for, toys and figurines. Next up, let’s look at a real engineering material, ABS. ABS is used just about everywhere, including your car, home, and office for everything from interior bits and pieces to your mouse and computer case. Airwolf 3D was one of the first companies to make desktop 3D printers capable of printing in ABS. Why? Because ABS is an engineering-grade material that can be sanded, finished, painted, and used in real world applications for end-use components. In fact, we printed out thousands of 3D printers using ABS as the main material. For best printing, keep your heated bed to at least 120 degrees Celsius, apply a coat of Wolfbite and print in an enclosed environment. We optimized the AXIOM 3D printer for ABS and hotter materials. Now for the real test. How did ABS compare to PLA? As ABS and PLA are the most frequently used materials on the desktop, which one is stronger? Turns out ABS is weaker than PLA. With the same 285 lb load, the ABS hook snapped instantly. We didn’t bother to reduce the weight as this is really meant to be a test of ultimate strength. The results should not come as a surprise, however, because ABS has a lower tensile strength of 4,700 psi compared with 7,250 psi from PLA. However, you could design a stronger hook using more material out of ABS that could match our PLA hook’s strength. In that case, you would not have to worry about the unpredictable nature of PLA. But we’re really here to find the strongest 3D printing material for your desktop printer. And for that, we need to start looking into more exotic materials, starting with nylon. There is a great type of nylon for 3D printing called Nylon 910. We print Nylon 910 at 250 degrees Celsius with the bed at 70-100 degrees Celsius, using Wolfbite Nitro for the ultimate bed adhesion. Also remember to print in an enclosed environment for best results. Nylon is a great material for making structural parts. Compared to ABS with a tensile strength of 4,700 psi, nylon’s estimated tensile strength of 7,000 psi is head and shoulders above ABS. Notice how I stated “estimated.” I say that because there are several different types of nylon with strength varying in between. In the video, notice how the hook initially bent, but didn’t yield until hundreds of pounds later, 485 pounds in this case. As we can see, nylon is a predictable material that works great in load applications. In fact, every Airwolf 3D printer built over the course of the last three years uses 3D-printed nylon gears for the ultimate in performance and wear characteristics. Polycarbonate: The True King of Desktop 3D Printer Filaments? Now let’s talk about polycarbonate. Since 2014 with the introduction of the Airwolf HDx, we’ve been printing in this incredibly strong and heat-resistant material. What makes printing polycarbonate unique is the extraordinarily high temperatures. First, the bed should be at 145 degrees Celsius or higher. Second, the head should be at 290 degrees Celsius or higher. Both of those temps are far, far out of the range of conventional desktop 3D printers. Finally, you’ll need to enclose polycarbonate as it will warp quickly if printed in an open environment. The collection of broken 3D-printed hooks after completing the material strength test. So how did polycarbonate fare? We suspended 685 pounds from that little hook! Polycarbonate is the undisputed king of materials for desktop 3D printing. Even we were surprised at polycarbonate’s strength. In comparison to nylon at 7,000 psi, polycarbonate’s tensile strength of 9,800 psi makes it the ideal choice for high-strength, functional components. When printed correctly, such as on an Axiom 3D printer, PC is an incredibly strong material. Also, remember that PC has a much higher glass transition temperature than all the other plastics mentioned here. Compared to its closest competitor, ABS, polycarbonate can take about 40 degrees more heat before deforming. In short, polycarbonate is the undisputed king of desktop 3D materials. In addition to this fun “hook test”, Airwolf 3D staff tested its engineering-grade materials using consistent, repeatable ISO 527 standards. 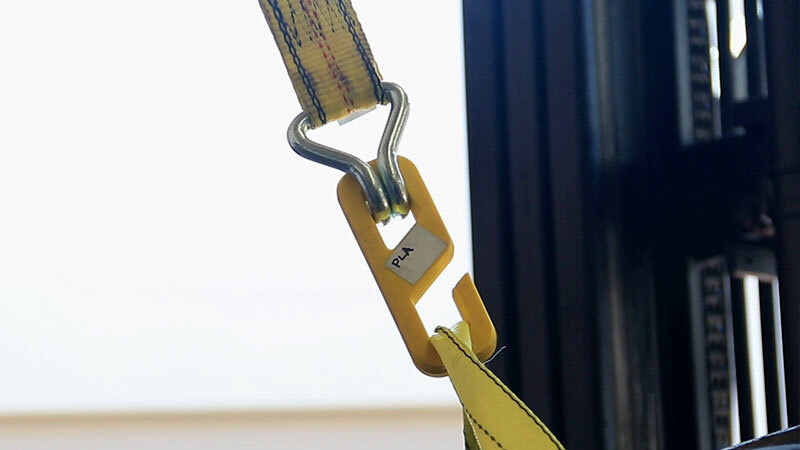 You can read more about this here: Material Testing Part 1: Tensile Strength ISO 527 and you can also download data sheet for each material by following the hyperlink below. Did you know that you can 3d print in over 40+ materials? There are dozens of types of filaments available to you, including harder polymers such as polycarbonate and flexible materials such as TPU. 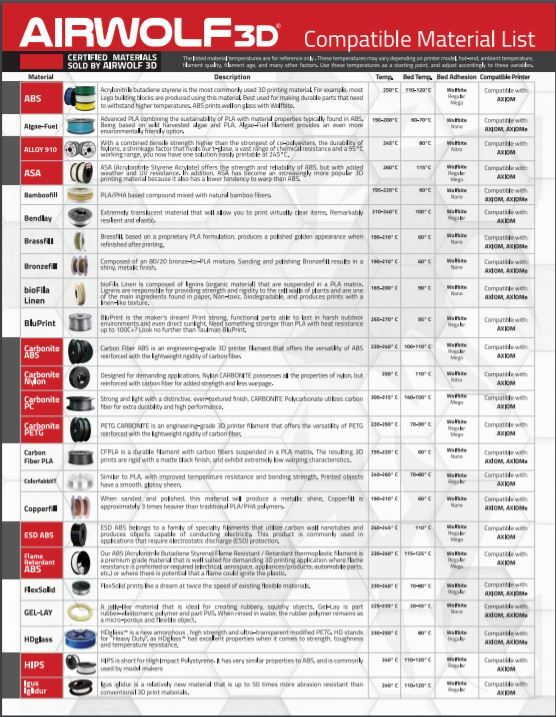 Download this handy list of commonly used materials. This two page reference chart includes the recommended hotend temperature and bed temperature for optimal 3D printing settings of each material.